My daughter Rebecca recently sent me the following link regarding how educational paradigms are being challenged across the globe. This is due to countless factors, but for those who have chosen to depart from institutionalized education, to create their own educational experience, I think you’ll find this talk by Sir Ken Robinson inspiring, challenging, and motivational. 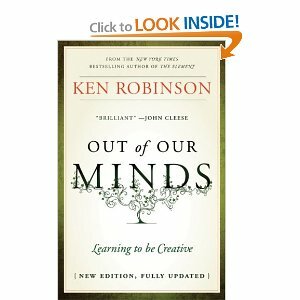 Robinson is the author of Out of Our Minds: Learning to be Creative, which is on my book list for summer reading. His talk on new educational paradigms seems timely for me personally, as I have determined to devote this summer to a neglected pursuit of the arts in our home. I intend to intentionally pursue music, drawing, art history, and literature in a new and fresh way. Robinson’s presentation has further convinced me of the importance of the arts and I think you’ll see why. One thing he notes is that children are being anesthetized in unprecedented numbers through the overuse of Ritalin; this presumably to enable them “to learn.” But Robinson notes that the opposite of anesthetization is aesthetic experience. This occurs through the arts (and even through science and math) when the human faculties are totally engaged, “senses are operating at their peak . . . when you’re resonating with the excitement of the thing you’re experiencing . . . when you’re fully alive.” This is what art, drama, music, and literature can do for us, and should do for us. So by way of encouragement, consider how you might devote this summer to a pursuit of the kinds of engagement that Robinson advocates here. Remember that the parts of the brain developed through engagement with the arts, can eventually help to build the capacity for those lagging academic connections. And even if that were not true, the emotional and spiritual connection provided by times of renewal, reflection, and refreshment through art, will be a beautiful end in and of itself. Here is the link. Let me know what you think! Such a fantastic video and I love your new focus on the arts and aesthetics. The thing I like about the video is that even though my “formal” education has come to an end, it is so important to continue to pursue the aesthetic arts in order to live and experience life more fully. Great write-up. Liked your words, Rea, and now I’m encouraged the read the book by Robinson. Thanks to you both for highlighting this great book! I know about TED and love what they do there. My daughter introduced us to their site and we’ve been challenged and motivated by so many of their presentation! Thank you and glad you can make it next week! Hi Rea, Thank you for this interesting post! I was just thinking of you yesterday! Are you going to be at CHEA/Pasadena in July? Yes, we will be there! I’m not speaking but will be in the booth. Are you going? Wonderful post – I’ve got that book on my reading list this summer, now! Rebecca sent me to your blog – I’m so glad to find you! Welcome, and I love your blog and have subscribed to it! Loved your musings about watching your kids grow up. And honestly, we think it just gets better in the teen years! You’ve a lot to look forward to! Cheers! on June 30, 2011 at 15:46 | Reply Passion Alive and Well in the Education World | Angela Maiers Educational Services, Inc.